A standard 2 man delivery of Eurocave products start at £99 inc. vat, delivery to Scotland and non-mainland addresses will incur an additional charge, please call for a quotation. Please ensure the person receiving the unit has a copy of this note. Please ensure we have the contact name and telephone number at the delivery address. Supplementary charges apply for large orders or complicated deliveries. Access approaching or into your house? Any wooden floors that will need protecting? Are there stairs to go up or down? Are doorways, corridors and turns wide enough? Cabinets cannot be lifted over banisters or lowered into wells. The delivery will be proposed for the next particular date that a route is planned to your area. Deliveries begin at 7am. If you wish, we can arrange for your delivery to be the first of the day, subject to availability. There is a £60 (+VAT) charge to rearrange the deliveries on that day to start at your address. We can also arrange your delivery for a specific date of your choosing, 48 hours’ notice is required. The charge for this service is £150.00 (+VAT). The working day before your delivery, we will be able to indicate to you, upon request, whether the delivery will be made am or pm. Please understand that this is an estimate and depends upon traffic conditions, distances between customers and time taken during earlier deliveries. In any event, the delivery company will call you 1 hour before they deliver. Please take care that the unit you have ordered will fit in the designated room and through any passages, stairwells, landings and doorways on the way to the destination room. We cannot take responsibility for this. Unless you have already informed us otherwise, delivery will be made to a ground floor. The delivery company are able to deliver large cabinets up or down flights of stairs but you must inform us in advance. If access is particularly difficult, and extra people are required to assist with the delivery, there will be a delivery supplement of £100 (+VAT). A large cabinet is very heavy, heavier and larger than a domestic fridge and may require extra people to carry it. The delivery men are not permitted to accept help lifting or manoeuvring a cabinet. Doors cannot be removed from your premises or the cabinet itself by the delivery crew. If, because of previously unadvised obstructions, the delivery men cannot on their own take the cabinet to the required location they will either abort the delivery and return the cabinet to the warehouse for rescheduling with extra people or, on specific instruction, leave the cabinet in an alternative ground floor location. If you cancel an arranged delivery or delivery has to be aborted a charge of £100 + VAT will be incurred to reschedule. This is in addition to any charge because a delivery team of more than 2 men is needed. If you live in an area with restricted parking, it is very helpful if you have a visitors parking permit available for the driver. If the delivery has not arrived 30 minutes before the latest expected time please call us to chase them for you. Please ensure that the delivery route is clear and that the area designated for the EuroCave is ready. The delivery company undertakes 10 deliveries per day and the delivery crew cannot wait for the route to the final cabinet location to be cleared. The delivery crew will unpack the Cabinet and place it in your prepared location. They will take away the pallet and packaging. They can help you if necessary to level the cabinet. Level the cabinet by adjusting the screwable feet. The user manual, keys, charcoal filter and humidity casette (not multi-temp) are inside the cabinet in a box. Please retain all the contents of this box. You will find all the instructions for dealing with these items in your User Manual. It is essential that the cabinet be allowed to stand for 48 hours before it is switched on. This is a warranty requirement. You may load wine into the cabinet within the 48 hour period, so long as the cabinet is not switched on. You should load the cabinet from the bottom upward, distributing the wine evenly throughout. The EuroCave works very gently; it may take many hours to reach operating temperature, depending on ambient and the extent it is filled. The emptier the cabinet, the greater the circulation of air and thus the less accurate the temperature regulation will be. Please do not sign the delivery note until you are completely satisfied that the delivery has been carried out without fault. Goods signed for unchecked will be deemed to be in good condition and without aesthetic fault. If you have any problems during the delivery please call us directly. We cannot accept any claims for loss, damage or shortcoming that should be apparent on delivery if you or a third party receiving delivery on your behalf have signed the delivery note, and NOT noted any issues on it. We will not be responsible for physical/aesthetic damage notified after delivery. 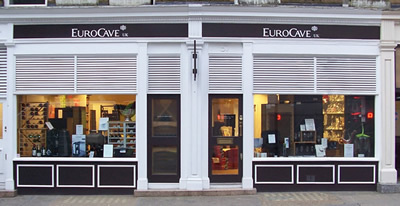 PLEASE TELEPHONE EuroCave UK ON 020 7935 4679 IF YOU HAVE ANY PROBLEMS. Only if our office is closed, you should call SWIFTCARE DIRECT ON 01295 816521, quoting your order number.